Many times we have to use the rounded corners in our projects while developing websites or applications. Lots of web designers are struggling with the corner Images to do it. Using image are old and tricky but if i say we can do it without using the images it is possible …. will you trust me. Yes its true we can round corners without using the images. What we have to do is we have to use CSS 3 Tags. Problem is all the browser’s will not support it. But good news most of the modern browsers support it. 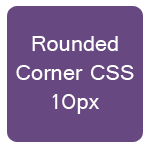 Making Rounded Corners CSS is given below use it. Now you will see you div is having the rounded corners. Check this code with all the browsers. So our final code will look like this. Thats it now check your IE browser it will run it in IE. But remember it will not work in IE 8, 7 , 6. Get tutorials delivered to your inbox!